The owl was not behaving normally; the rehabilitator suspected that the owl had signs of lead toxicosis. 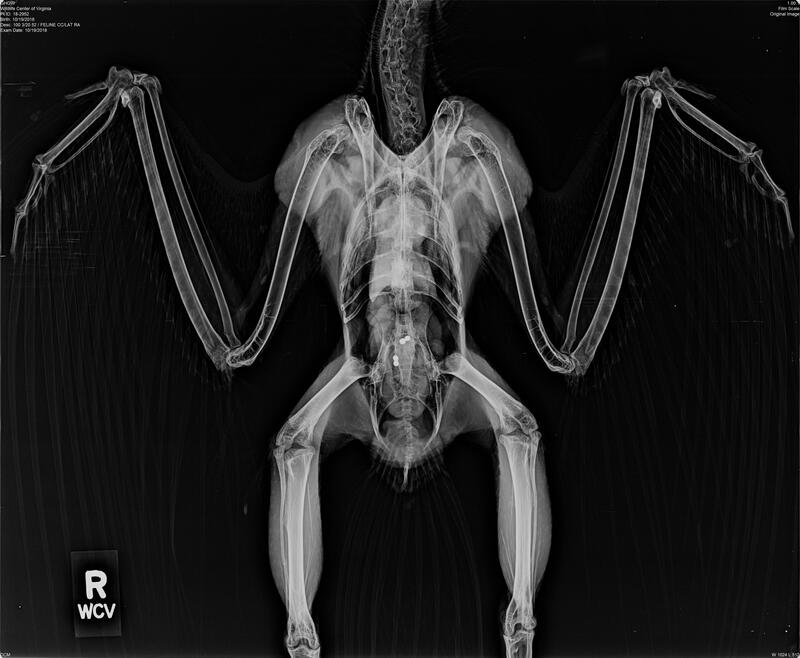 She took the owl to her veterinarian for an examination; radiographs were taken and four metal pellets were seen in the bird’s digestive tract – likely lead pellets, causing the neurologic symptoms. The owl was transferred to the Wildlife Center, where the veterinary team drew blood from the owl and performed a lead test. Results were extremely high – results were 2.36 ppm. The team decided to attempt treatment, though recovery from severe lead toxicity is rare, since the animal can have permanent neurologic symptoms and organ damage from the lead. The following day, the veterinary team performed a gastric lavage on the owl – the equivalent of stomach pumping. The four metal lead pieces were successfully removed. The owl was started on a course of chelation therapy, to essentially “scrub” the lead from the bird’s bloodstream. After a five-day course of treatment, lead levels dropped to 0.231 ppm – indicating that treatment was working, though lead was still present. After several days of rest from the chelation, an additional lead test was taken, with a reading of “low”. The owl has been bright and alert; the bird is also eating well and casting pellets normally. Overall, the veterinary team is surprised at how well the owl is doing. This Great Horned Owl’s story emphasizes the importance of switching to a non-lead ammunition when hunting. When shot with lead ammunition, game animals can contain very small pieces of lead, which fragment upon impact with the target. These very small fragments are ingested by those who eat the game animals – both humans and other wildlife. Your donation will help provide veterinary medical care to this Great Horned Owl ... and the 3,000 other wild patients the Center will treat this year. On November 15, the Wildlife Center lost power and suffered damage to fences and outbuildings during a severe ice storm. Patients and education animals that were housed outdoors were quickly evacuated and moved into crates indoors. Because of the power outage, some patients were transferred over the weekend to other rehabilitators or wildlife hospitals in the area. On November 18, Great Horned Owl #18-2952 was transferred to another wildlife rehabilitation center; a veterinarian from that center was presenting at the Call of the Wild conference and was able to bring the owl back with her. That hospital will continue the owl’s pre-release conditioning and release the owl when appropriate. Great Horned Owl #18-2952 continues to do well following treatment for lead toxicity. The owl has been bright and active with a strong appetite. On November 13, the rehabilitation team moved the owl to a larger flight pen to begin flight conditioning. Great Horned Owl #18-2952 has been doing very well during the past few days; the owl is bright, alert, reactive and has had no neurological signs. On November 3, the owl was moved to an outdoor enclosure for continued observation. If the owl does well in the coming weeks, he’ll be moved to a larger flight space.